So who is Victoria Abbott? 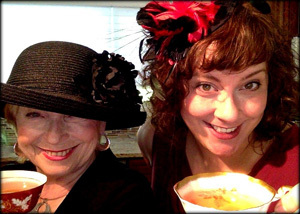 Victoria Abbott is a collaboration between the always very funny and creative artist, photographer and short story author, Victoria Maffini and her mother, Mary Jane Maffini, award-winning author of three mystery series and two dozen short stories. Their four miniature dachshunds are understandably outraged that a pug and some Siamese cats have wiggled their way into the series. And just what is The Christie Curse? 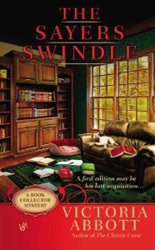 The second book collector mystery The Sayers Swindle arrived on December 3, 2013. We hope you like the cover. 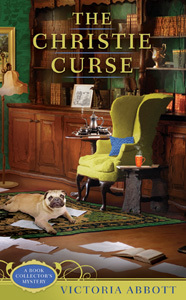 Dead bodies and disappearing people complicate Jordan's search for Vera's stolen Dorothy L. Sayers collection. Where's Lord Peter Wimsey when you really need him? The Wolfe Widow, book three in the series, hit the shelves on September 2014. Jordan has a little crush on that Archie Goodwin and Vera reminds her a bit of Nero Wolfe. Not in a good way. All three book collector mysteries are available in audio and Large Print. Look for the Wolfe Widow later this year in LP. We look forward to keeping you up late with Jordan for years to come. 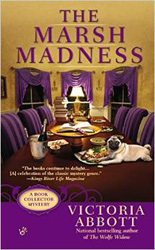 The good news is that the fourth book, The Marsh Madness, is now available and we are happily working on the fifth, The Hammett Hex.